The Thermador Freedom collection brings unique modular column design allowing you to create customized refrigeration system from various sizes and configurations. In short, it offers unmatched flexibility. 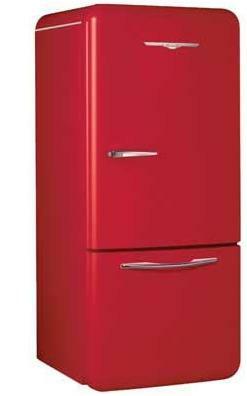 Freedom collection consists of bottom freezer refrigerator, freezer column and fresh food column. 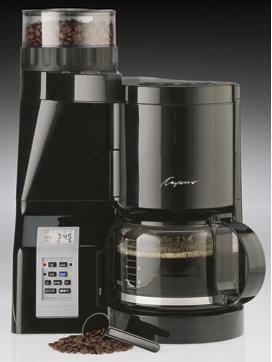 The new Capresso coffee maker (CoffeeTEAM S) comes with an easy-to-read white-on-black illuminated display and sharp looking silver metallic control panel. 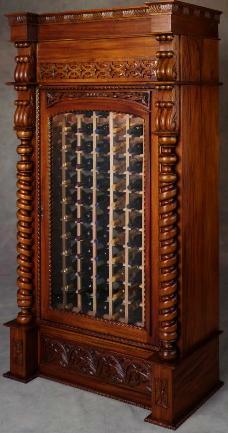 Baalbek wine cellars handcrafted from mahogany in Oregon, from all places. What was a one time project, has grown into custom wine cellar design. See also Vinotheque wine cellars. ILVE kitchen range Majestic series is available in 6 sizes – 60, 70, 90, 100, 120 and 150 cm wide, and 6 finishes – stainless steel, matt, antique white, burgundy, blue and green. 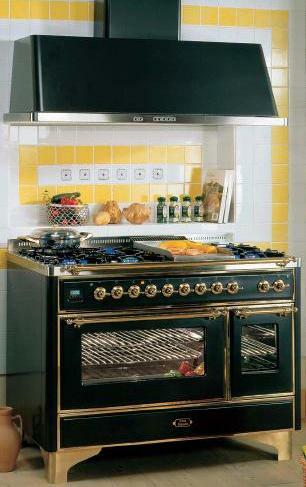 Handles and hardware are available in stainless steel, brass and chrome. Jenn-Air Oiled Bronze kitchen suite features refrigerators, dishwashers, wall ovens, cooktops, warming drawers and hoods that combine a rich bronze finish with traditional Jenn-Air quality. 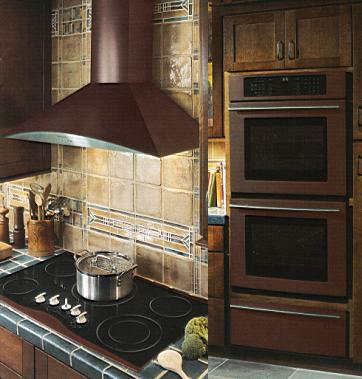 The bronze finish combined with stainless steel handles and hardware, give a unique impression of depth, warmth and style. 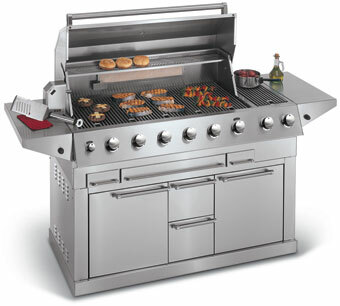 The Electrolux outdoor kitchen isn’t just an Electrolux grill. Dimensions are H26.25″ x W57″ x D28.25″. 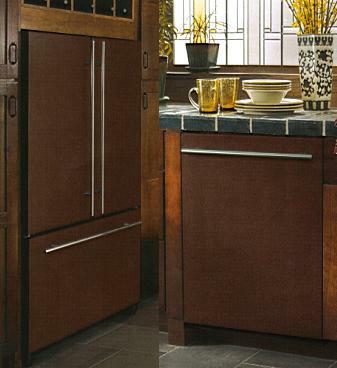 A Northstar refrigerator by Elmira Stove Works will wonderfully complement a Northstar range, as long as the colors match. Overall dimensions are H69.13″ x W29.75″ x D34.5″. See also Big Chill retro refrigerator. 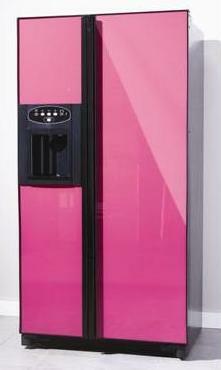 New glass door refrigerator to brighten your kitchen is the CAFF22 American style fridge freezer from Caple. 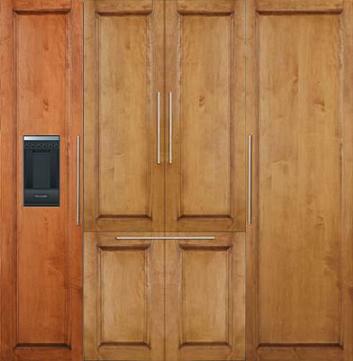 Available in 10 stunning glass door colors – pink, black, turquoise, white, pale blue, silver, red, cream, lime green and mid blue, it will perfectly blend into any kitchen. Caple.